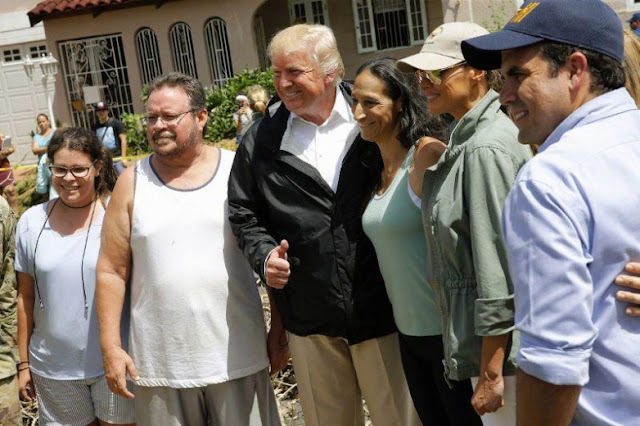 U.S. President Donald Trump and first lady Melania Trump pose with residents while surveying hurricane damage in San Juan, Puerto Rico, U.S., October 3, 2017. WASHINGTON - President Donald Trump praised Puerto Rico’s people on Friday, calling them “wonderful” and having an “unmatched spirit” as the U.S. territory struggles to recover from Hurricane Maria and he weathers criticism for his handling of the disaster. But the compliment was backhanded as Trump alluded again to Puerto Rico’s parlous economic state even before the damage inflicted by last month’s hurricanes Irma and Maria. Irma grazed Puerto Rico and Maria hit directly as the most powerful storm to lash the island in 90 years, devastating the power grid and other infrastructure. Puerto Rico, which owes $72 billion to creditors, had already been grappling with a bankruptcy crisis. The island has spent most of the last decade in recession and its poverty rate is over 40 percent. Trump has faced criticism for his administration’s slow response, seen by critics as less agile than it would have been for a similarly battered region of the U.S. mainland, and for bringing up the cost of relief efforts when he visited the island earlier this month. Despite the Republican president’s suggestion this week that Washington will not help indefinitely, U.S. lawmakers and other administration officials have pledged support. On Thursday, the Republican-led U.S. House of Representatives approved $36.5 billion in emergency relief for Puerto Rico and other areas hit by recent disasters. Approval from the Senate, also controlled by Republicans, is expected in coming weeks. House Speaker Paul Ryan was scheduled to lead a bipartisan congressional delegation to Puerto Rico on Friday. “I think it’s conduct unbecoming of a leader of the free world,” Mayor Carmen Yulin Cruz said on NBC on Friday, referring to Trump’s use of Twitter. “The president uses Twitter in order to disperse hate, so whomever deletes that account should be nominated for the Nobel Peace Prize,” she said. President Donald Trump praised Puerto Rico’s people on Friday, calling them “wonderful” and having an “unmatched spirit” as the U.S. territory struggles to recover from Hurricane Maria and he weathers criticism for his handling of the disaster.